Your family won’t be able to access money left in a will until your estate goes through probate, which can last months or even years. Since most funeral providers require full payment upfront, this means your family will likely have to cover your funeral costs out of pocket, unless you take proper action now. cover funeral expenses. The policy will pay out to the named beneficiary as soon as your death certificate is available. But you’ll likely have to undergo a medical exam and may be disqualified or face costly premiums if you’re older and/or have health issues. There is also burial insurance specifically designed to cover funeral expenses. Also known “final expense,” “memorial,” and “preneed” insurance, such policies do not require a medical exam. However, you’ll often pay far more in premiums than what the policy actually pays out. If you have any type of insurance to cover your funeral, make sure your family knows about it! These policies are often never cashed in because the family didn’t know they existed. While such prepaid plans may seem like a convenient way to cover your funeral expenses, these plans can have serious drawbacks. As mentioned earlier, if the funeral provider buys burial insurance, you’re likely to see massive premiums compared to what the plan actually pays out. And if they use a trust, the plan might not actually cover the full cost of the funeral, leaving your family on the hook for the difference. Plus, most states have inadequate laws protecting funds in pre-need plans, putting your money at risk if the funeral provider closes or is bought out by another company. 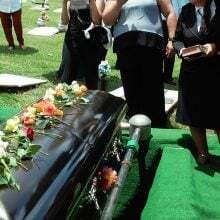 If you’re looking to buy a prepaid funeral plan in order to qualify for Medicaid, be sure to consult with us first, as not all pre-paid funeral plans are actually Medicaid compliant, even if the funeral home says they are. Moreover, if the irrevocable trust is not set up correctly, it may violate Medicaid’s look-back period, delaying your eligibility. Many banks offer payable-on-death (POD) accounts, sometimes called Totten Trusts, that you can set up to fund your funeral expenses. The account’s named beneficiary can only access the money upon your death, but you can deposit or withdraw money at any time. Another option is to simply open a joint savings account with the person handling your funeral expenses and give them rights of survivorship. However, this gives the person access to your money while you’re alive too, and it puts the account at risk from their future creditors. You don’t need to buy a pre-built trust from a funeral provider. We can create a customized living trust that allows you to control the funds until your death and name a successor trustee, who is legally bound to use the trust funds to pay for your funeral expenses exactly as the trust terms stipulate. With a living trust, you can change the terms at any time and even dissolve the trust if you need the money for other purposes. Alternatively, if you need an irrevocable trust to help qualify for Medicaid, we can create that too and help you ensure the trust stays totally compliant with all of Medicaid’s requirements. To help decide which option is best suited for your particular situation, consult with us. We can put an estate plan in place that includes adequate funding to ensure your funeral services are handled just as you wish—and your family isn’t forced to foot the bill.